Canon on Thursday announced its new REALiS SX800 multimedia projector, which Canon touts as an affordable alternative for professional users. The latest addition to the company’s multimedia projector line provides sharper images while supporting widescreen notebooks and desktops. Featuring 3,000 lumens and a contrast ratio of 900:1, the projector is designed for 1,400-by-1,050 sharp text viewing. The projector’s Liquid Crystal on Silicon (LCOS) reflective LCD panels help deliver detailed, lattice-free motion and still images. Canon is the proprietary owner of the Aspectual Illumination System (AISYS) used on this model, which helps it deliver vibrant colors, high contrast and brightness while maintaining a compact design. 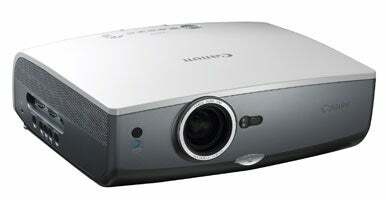 Canon also included some features found on its higher-end projectors, such as a 1.5x zoom lens. The zoom lens minimizes glare and ghosting and allows uses to change the screen size which makes placement of the projector more flexible. The $2,499 REALiS SX800 also includes Auto Set Up features designed to make connectivity quicker and easier. This new model contains internal circuitry which will run the fan and cool the projector even if the user has to pack up quickly— Canon calls it: Off and Go.